Nutmeg essential oil is famous for its health benefits. It was used during the Elizabethan era as a treatment for the plague. Indians used nutmeg oil to treat intestinal problems and the Egyptians included it in their embalming recipe. Nutmeg oil is a staple in Ayurveda used to treat fever and respiratory problems. The Chinese have also used nutmeg oil in traditional medicine to treat pain and inflammation. Today, it is a common ingredient in cough syrups, toothpastes, and aromatherapy to improve health and uplift mood. Years of research and centuries of anecdotal evidence show why nutmeg oil is so popular. This wide range of health benefits makes the oil suitable for a host of healthcare treatments. The spicy aroma is beloved in culinary dishes and works just as well scenting your home. Read on to find out more about the oil and how you can incorporate it into your daily health routine. What Is Nutmeg Essential Oil? Nutmeg essential oil is extracted from the seeds of the true nutmeg tree known by the botanical name Myristica fragrans. This evergreen tree is characterized by dark leaves and produces the nutmeg fruit. Inside the fruit is the nutmeg seed, which is surrounded by a shell called mace. The essential oil is derived from the nutmeg seeds through an extraction method known as steam distillation. Nutmeg oil has an inviting aroma and boasts impressive health benefits. For these reasons it is commonly used in the fragrance and pharmaceutical industries. 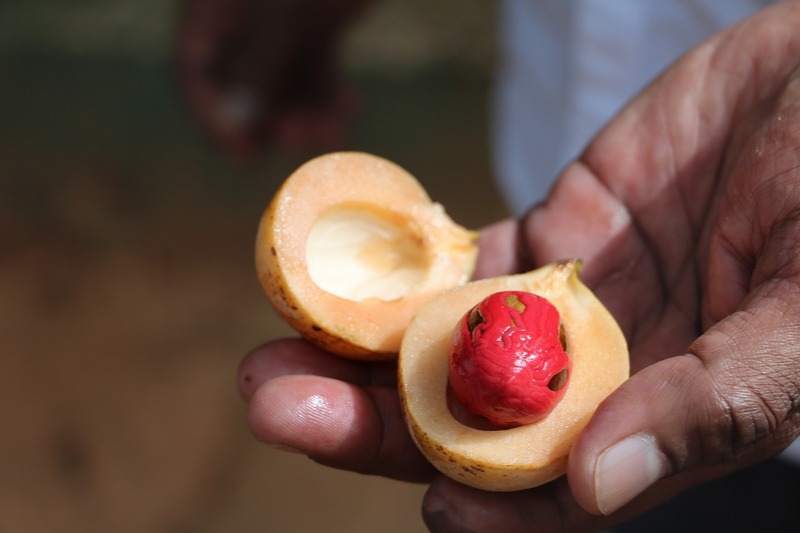 The two main producers of nutmeg oil are Java, Indonesia and Grenada. This oil is also popularly produced in various Caribbean islands, Sri Lanka, Papua New Guinea, Malaysia, and India. Nutmeg essential oil is mainly exported to Europe, the United States, and Japan. This essential oil is comprised of 60 to 80 percent d-camphene. Nutmeg essential oil contains chemical compounds that include uric acid, beta-pinene, limonene, myristicin, and terpineol. Nutmeg oil is colorless or pale yellow when extracted. Nutmeg essential oil features a spicy, warm, and nutty aroma. It is used as a fixative for citrus oils in the perfume industry. A fixative is a fragrance oil that is long-lasting and extends the aromatic nature of perfumes and colognes. The warm aroma of nutmeg essential oil blends well with clary sage oil, geranium oil, lavender oil, and orange oil. There's a reason why nutmeg is commonly found in toothpastes and mouthwashes. This oil boasts powerful antibacterial properties that can help to eliminate bacteria that cause bad breath and tooth decay. Nutmeg oil is gentle enough for sensitive or infected gums. The chemical compounds in nutmeg oil don't just freshen breath. They also eliminate bacteria that cause canker sores and mouth ulcers. You can make your own nutmeg oil toothpaste at home. Combine 2 tablespoons of calcium bicarbonate, 1 teaspoon baking soda, 1/4 teaspoon xanthan gum, and 1/2 a teaspoon of xylitol. Mix well and add 2 tablespoons of coconut oil and 5 drops each of nutmeg oil and cinnamon essential oil. Add to a squeeze tube and use twice per day. You can also get the healthy mouth effects of nutmeg oil by simply doing an oil mouth rinse. This technique is also known as oil pulling. Simply add a few drops of nutmeg essential oil to your mouth and swish for 2 to 3 minutes. The nutmeg oil will work to remove bacteria and leave a spicy, fresh aroma for clean breath. People who live with chronic pain experience a significantly lower quality of life. Pain takes on many forms in our increasingly busy world. Joint pain, muscle aches, arthritis, and menstrual cramps can all decrease the enjoyment in our daily lives. Pain is often treated in modern medicine with powerful prescriptions that can cause addiction and a host of negative side effects. Luckily, nutmeg oil has been used for centuries to treat pain and is a natural alternative without any negative side effects. A study published by the Journal of Food and Nutrition examined the effects of nutmeg oil on rats with inflammation-related pain. Researchers injected the joints of some mice with nutmeg oil. The results showed significantly lower pain symptoms in the mice treated with nutmeg oil in comparison to the control group. Scientists believe that nutmeg's anti-inflammatory properties help to reduce localized swelling that can cause pain. Muscle aches from a hard gym workout can make you sore for days. Speed up the recovery process with a hot, relaxing bath. Simply add 5 drops of nutmeg essential oil to steaming bath water and soak for 10 minutes. Alternatively, you can add nutmeg oil to your sports massage oil to target sore areas. Combine a few drops of nutmeg oil with coconut oil and heat gently in the microwave. Apply directly to achy muscles and massage gently for 5 minutes. Nutmeg oil can help to treat breathing problems including bronchitis and asthma. It’s often found in cough syrup to treat spasmodic cough and chest congestion. Chemical compounds in nutmeg oil help to loosen mucus that an cause congestion and severe cough. A study published by the Journal of the American Medical Association examined the components of nutmeg in alleviating respiratory problems. Researchers found that camphene in nutmeg oil worked as an expectorant while the aroma of nutmeg helped to inhibit the production of mucus. Create a steam bath to alleviate chest congestion and open up airways. Bring water to a rolling boil and remove from heat. Add 4 drops of nutmeg essential oil to the water. Cover your head and neck with a towel and lean over the pot. Inhale for 5 minutes. You can also add a few drops of the oil to a steam diffuser for fast results. More than 300 million people across the globe suffer from depression according to the World Health Organization. The treatments for depression often involve powerful antidepressants that have a list of serious side effects including hallucinations and death. There is a healthier alternative thanks to nutmeg oil. Nutmeg essential oil boasts therapeutic properties and chemical compounds that can help to improve cognition and uplift mood. Sailors who traveled the Spice Route often chewed on nutmeg to prevent feelings of depression on the long arduous journey. Nutmeg oil works on neurotransmitters in the brain the same way prescription medications do. The oil signals the brain to produce happy chemicals such as dopamine, serotonin, and adrenaline. A study published in the Avicenna Journal of Phytomedicine compared the use of nutmeg to imipramine — an antidepressant known as Tofranil. The study revealed that 500 milligrams of nutmeg oil was as effective as 15 milligrams of Tofranil in treating depression. A second study published by the Journal of Medicinal Food examined the use of nutmeg oil on immobility in depressed mice. The results showed that 10 milligrams of nutmeg oil was most effective in reducing immobility times and boosted happy chemicals in the brain. Beat depression and feelings of sadness by adding 3 to 4 drops of nutmeg oil to your diffuser. Get comfortable and focus on deep breathing while inhaling the warm, spicy cent. Even though nutmeg oil ahs brain stimulating properties, it can also help you achieve a better night's sleep. The calming properties of nutmeg oil are even stronger than lavender oil according to some research. Scientists believe the magnesium in nutmeg oil helps to reduce nerve tension. The oil also signals the brain to release serotonin, a brain chemical that is responsible for relaxation and sedation. One study printed by the International Journal of Molecular Science researched the effects of nutmeg on animal sleep. The researchers used nutmeg in aromatherapy to induce calm and promote better sleep. Results showed that animals that were subjected to nutmeg aromatherapy had reduced body movement during the night. This indicates a more restful and peaceful sleep. To reap the sleep benefits of nutmeg oil, add a few drops to your diffuser before bed. Focus on breathing deeply and inhaling the fragrant nutmeg aroma. You can set your diffuser to emit the oil for 5 minutes before bed or let the diffuser run on 1-hour cycles. The hourly diffusion of nutmeg oil can help keep you resting all night long if you suffer from insomnia. Nutmeg oil contains a high concentration of monoterpenes that give it antiseptic and analgesic properties. Nutmeg oil is a powerful disinfectant and can help to ward off the common cold and flu. The monoterpenes work to disinfect the air and kill bacteria that can make your sick. Add a few drops of nutmeg oil to your diffuser to fend of infections. You can also place a drop of the oil onto your skin below your nose or behind the ears to stay healthy when travelling on airplanes or in crowded public transportation. The kidneys are the purifiers of the body. They work to eliminate toxic compounds that can make us sick or cause serious health problems. Nutmeg oil supports the kidneys in their battle to remove harmful compounds from the body. It can also help to prevent kidney stones. The antioxidants in nutmeg help to detoxify the body. In an animal study published by the American Chemical Society researchers found that the chemical compound myrislignan is responsible for most of the liver protection benefits of nutmeg oil. This compound regulates the PPARα gene that protects the kidneys and can restore healthy levels of lipids. Add 4 drops of nutmeg essential oil to your diffuser at each meal to promote healthy kidneys. Alternatively, you can substitute food grade nutmeg oil for ground nutmeg in recipes for soups and stews. Nutmeg essential oil is used in Asia and Europe to streamline digestion and alleviate digestive problems. Nutmeg can treat nausea and motion sickness as well as soothe stomach cramps and relieve gas. A study published by Plant Foods and Human Nutrition found that the antioxidant capacity of nutmeg oil helped to prevent oxidative stress by 70 percent. The antioxidants work to eliminate free radicals that cause cell degeneration through oxidation. This cell degeneration can lead to a host of human health problems including digestive tract disorders, cancers, and premature aging. A series of studies published by Science Direct examined the potential of myristicin — one of the main chemical components in nutmeg oil. Myristicin targets the spleen, stomach, and digestive tract to stop diarrhea and alleviate abdominal pain. Researchers also found that nutmeg oil trigger the production of bile and gastric juices that help to break down food and absorb nutrients more readily. You can reap the digestive benefits of nutmeg oil through aromatherapy. Add nutmeg oil to your diffuser or place a few drops on your wrists to alleviate feelings of nausea. For the greatest digestive health benefits, add nutmeg to your diet. Pure nutmeg oil should never be consumed orally. Instead, look for food grade nutmeg oil and substitute for ground nutmeg in recipes. The Food and Drug Administration, known as the FDA, certified nutmeg essential oil as generally safe. There are few side effects associated with the use of nutmeg essential oil, but certain individuals should avoid it. Nutmeg essential oil is not recommended for women who are pregnant or breastfeeding. Large doses of nutmeg oil can cause miscarriage. It can also inhibit the production of prostaglandin, a chemical that is essential during the birthing process. These side effects typically only occur only when nutmeg oil is consumed in amounts greater than seven grams. Err on the safe side and avoid nutmeg essential oil when pregnant. Always perform a patch test on skin to ascertain any potential allergic reactions. Never apply nutmeg essential oil undiluted directly to skin. Always combine nutmeg oil with carrier oil such as olive oil, grapeseed oil, or fractionated coconut oil before applying topically. Make sure to buy only pure, unaltered nutmeg essential oil from a reputable brand. Low quality nutmeg oils can contain synthetics and chemicals that can trigger rash and redness in people with sensitive skin. Nutmeg essential oil acts as a stimulant, which can be dangerous for people who have epilepsy. Chemical compounds such as myristicin have also been linked to hallucinations and convulsions. Consult with your physician before using essential oils if you take medication or suffer from any serious conditions. The spicy, warm aroma of nutmeg invokes visions of autumn and vibrantly colored trees. The fragrance is long-lasting, making it a great essential oil for your health and your wallet. The scent of nutmeg oil will linger in your home or meditation room for hours. Nutmeg oil helps to uplift mood and prevent depression. Antibacterial and anti-inflammatory properties help to fight of infections and alleviate pain. It's most famous uses include streamlining digestion and boosting oral health. Add this oil to your collection and live a spicy and healthy life.